This basic biscuit recipe is super easy to make and can be used as the base for lots variations of biscuit- lemon, orange, chocolate chip, cinnamon, etc. 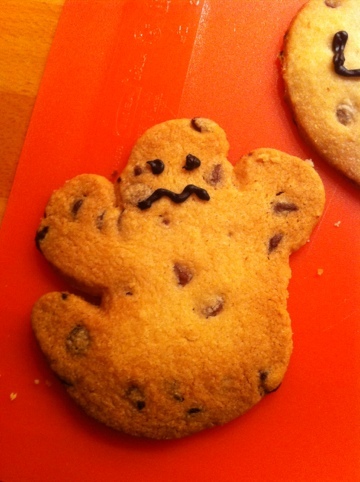 We made chocolate chip ones recently for Halloween, hence the ghost shape, which were delicious. I think we’ll probably make cinnamon or ginger ones nearer to Christmas. We often make a few batches of these biscuits in one go, but we only bake one batch on that day. With the other batches we form a sausage shape and wrap it in cling film and place in the freezer. Then when we fancy a couple of biscuits you simply use a sharp knife, dipped into hot water, to cut slices 1cm thick. Then bake for 15 minutes as per usual. We often do the basic dough for this and then before the biscuits go in the oven we add mini smarties or chocolate chips to the top, as they cook they’ll melt into the dough. Easy peasy perfect biscuits! 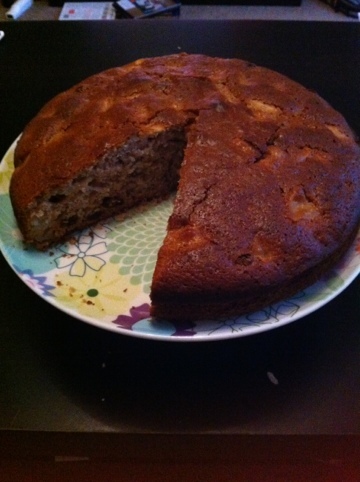 The Herman Cake is a friendship or ‘chain cake’. Just like the letters you had as child except this time you end up with a scrumptious cake instead of random letters! Once you’ve looked after and nurtured your Herman cake for nine days you split the mixture into 5 ‘baby Hermans’. You then give away four of the babies to your friends and use the fifth one as the base for your cake, simple! Although it may seem like a hassle to spend ten days making a cake, it will certainly be worth it. Start by sprinkling 1 tbsp of sugar over the warm water, then sprinkle the yeast on this. Leave the mixture in a warm place for about 10 minutes so that it doubes in size. Mix all the other ingredients and the yeast mixture together in a large bowl and stir together. Cover the bowl loosely with a tea towel and place in a warm place. Follow the instructions below to finish your Herman cake. These are also the instructions that you need to give away with your four baby Hermans. Day 2 – Stir Herman 3 times throughout the day, with a wooden spoon. Day 4 – Feed him 200mls milk, 200g caster sugar and 250g sifted self-raising flour. Day 8 – Stir Herman (don’t forget to talk to him). Day 9 – Feed Herman as you did on day 4. Then split into 5 little Hermans and give 4 away with these instructions. Cook Herman in a lined 7″ cake tin for about an hour at 180ºC. *There are numerous variations to this cake, chocolate, ginger, etc so feel free to add things other than apple, sultanas and cinnamon. There are loads of recipes for other variations, so have a check online for other options.